After debuting at No. 18 in last week’s initial College Football Playoff rankings, UCF remained in the same spot this week. 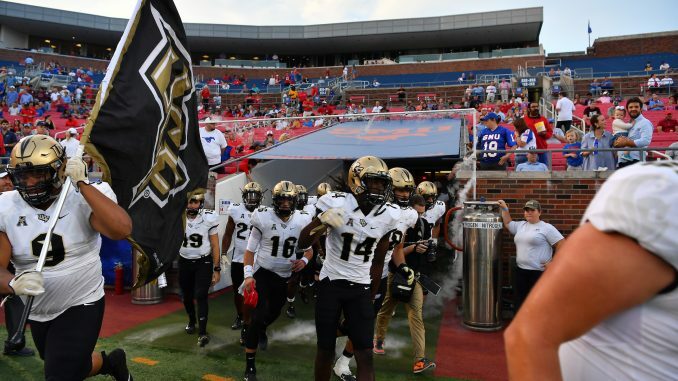 The Knights (8-0, 5-0 AAC) stayed undefeated on Saturday night, surviving a 31-24 scare at SMU. They are one of just five undefeated teams left in Division I, but last week’s rankings failed to put them close to the same level as the other four. In fact, four two-loss teams were ranked ahead of UCF last week. With some teams ahead of the Knights going down over the weekend, it looked as if they would climb a few spots. Instead, the committee placed eight two-loss teams ahead of them. UCF still leads the pack for the Group of Five’s bid in a New Year’s Six bowl game. Memphis (No. 22) is still the only other Group of Five team in this week’s rankings. UCF hosts UConn (3-6, 2-4 AAC) at 12 p.m. this Saturday before traveling to Temple (4-5, 2-3 AAC) on Nov. 18. After that, the Knights will have a couple opportunities to strengthen their resume. They host rival USF (8-1, 5-1 AAC) on Black Friday. If they finish at the top of the AAC East, they will then take on Memphis (8-1, 5-1 AAC) in the conference championship game.